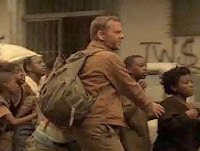 My take: This is "Jack Bauer and the Temple of Doom"-- swapping out little Indian children for little African kids. I doubt we'll get a plucky sidekick like Short Round telling Bauer that there's no time for love (boo!) but I also doubt that Kate Capshaw's decibal-crushing noisebox will show up either (yay!). Could be awesome... could be not so awesome... but I'm glad to see The Jack Sack made the trip to Africa! Prepare to meet Graem... in hell! Congratulations, you are my 10,000th commenter. You win a... burrito or something... I haven't decided yet. Ah, 24: Season 7 New Trailer! What Can Bring Us Together? Aliens!